On August 21, 2017, the shadow of the moon will draw a path across the continental United States, from Oregon to South Carolina. On campus we will see the moon obscure about 89% of the sun at maximum coverage. 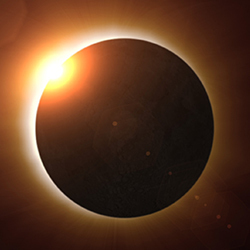 Join the College of Science and the Physics Department at the sundial in front of Jordan Hall of Science for a telescope’s view of the eclipse, free eclipse viewing glasses (while supplies last) and a few experts to answer your questions about eclipses, the sun, and the days events. 12:00 PM - Telecopes available, and volunteers will begin offering safe viewing glasses at Jordan Hall. 4:00 PM - Notre Dame’s viewing event ends. In case of clouds, please please join us in Jordan Hall of Science 105 for a discussion of the eclipse and a stream of the eclipse from a sunnier locale.